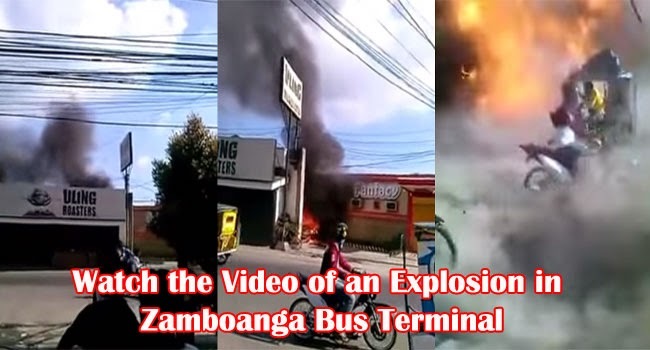 An actual video of an explosion at the front of a bus terminal in Zamboanga had been posted on Facebook on January 24, 2015 and is now making its round over the said social media. Deafening shouts were audible as many had been visibly hurt around the area. The said viral video had been posted on Facebook by Swaib M. Daligdigan who himself had sustained injuries and was immediately rushed to the hospital for medical attention. The 2 minute clip had been shared almost 22 thousand times only a day after it was posted. At the beginning of the video, thick black smoke had been visible coming from the back of a store named ‘Uling Roasters’ beside Fantacy Bar. There were some audible comments saying that firefighters were taking long to arrive.. The video had shown motorist were speeding by and also looked at the smoke. As soon as someone said that the fire might reach the electricity line, the explosion suddenly happened. Those in the motorcycles passing by seemed to have flown in the air. Shouts of shock and pain could be heard and then the person taking the video was shown with his right leg soaked in blood. He was soon taken to the hospital and now recovering with improved condition. According to GMA news, one died in the said incident while around 50 were injured.the explosion was due to a bomb inside a car park at the front of a bus station in Barangay Guiwan, Zamboanga City on January 23, 2015. The person had had taken the viral video is a police officer station in the area.